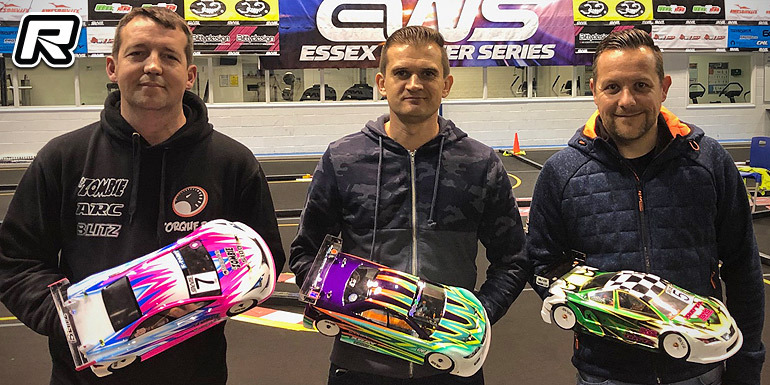 The 2018/19 Essex Winter Series marked the half way point this weekend with the third round of the championship. With Elliott Harper and Olly Jefferies tied on points at the top of the championship, both were looking to get their 2019 campaigns off to a strong start. 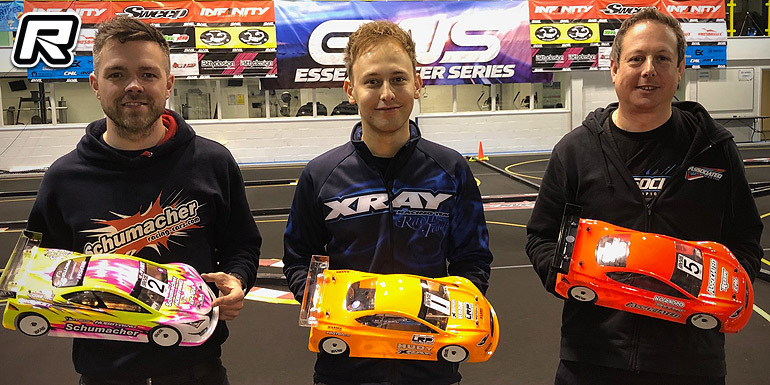 However, there was some surprise in the first qualifier when Elliott broke his Xray on lap two, it wasn’t Olly who took the lead of the group, but Associated’s Matthew White. Matt maintained his composure and took the round by a few tenths of a second over Olly’s Schumacher, with Kyle Branson taking third with his Capricorn chassis. Chris Grainger showed the improvements the Associated team had found by backing up his team-mate and taking fourth, with privateer Stefan Chodzynski rounding out the top five. Elliott rebounded in Q2, setting the quickest time with Olly again in second and Kyle in third. Elliott moved a step towards pole position by also topping the third round, ahead of Olly, Chris and Matt. The final qualifier saw a mistake from Elliott allow Olly to take the lead and, despite Elliott clearly having the faster car, he wasn’t able to re-pass Olly and thus Olly took the round and secured second overall, with Matt taking third and therefore third on the grid, his best result for some time. The single-leg A Final saw the pressure on Elliott as the start as Olly remained within a few tenths of a second. But by half way through, the Xray driver pulled a gap of around one-second, which he then maintained until the end. The A Final was not without action and drama, however, as the battle for third was a great race. Matt held the position for most of the run, with Kyle closing in around the 2-minute marker and spending the next couple of minutes trying to find a way past. He could find no way through and just two laps from the end unfortunately tagged Matt’s car, leaving him with a body tuck. Although Kyle waited for Matt to recover, it allowed Chris to move from fifth up to third, and Aaron rose to come through from seventh on the grid to take fourth, leaving Matt a disappointing fifth. Over in the Super Stock class, the championship leaders of Zak Finlay and Colin Jackson were coming off the back of, by their high standards, not great results at the EWS International event before Christmas, which they were no doubt keen to put behind them. Zak got proceedings underway and topped the first round with his Schumacher, ahead of Tony Broad and his privately entered Xray, Zak’s team-mate Marcus Askell, and the ARC’s of Colin Jackson and Darren Lee completing the top five. 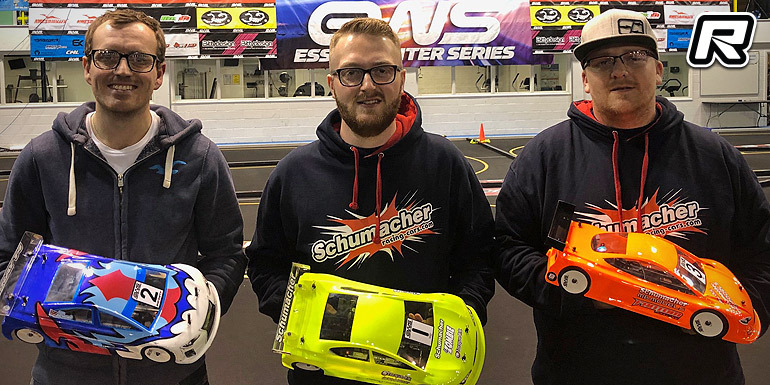 Zak remained on top in the second round, with fellow Schumacher drive James Hart in second, Ashely Wiffen (Awesomatix) in third, Northern Ireland’s Andrew Smith (Associated) fourth and Darren again fifth. Zak wrapped up pole position with another TQ in Q3, ahead of Tony, James, Ben Cosgrove and his ARC, and Marcus taking fifth, before Zak completed the clean sweep by taking the final qualifier ahead of Ben, Marcus, Ashley and Colin. The A Final saw Zak continue his great event, running away from the field at the start and quickly opening up a gap on the field. Tony was his strongest challenger, starting second on the grid kept Zak honest but not close enough to mount a challenge for the lead. Tony and Zak demonstrated their huge experience at EWS by pulling away, until James started closing in as the race time wound down. 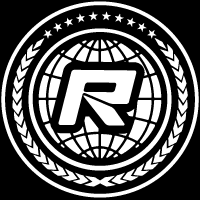 Despite James closing in on Tony, a mistake on the final lap essentially sealed the podium as Zak took a comfortable win, with Tony helping his championship cause with a strong second place, and James his first podium for a while at EWS with third. Behind, Marcus moved up from fifth on the grid after a mistake from Ben, but the drive of the race was from superstar bodyshell painter, Graham Kenny, moving from tenth on the grid up to fifth at the buzzer. 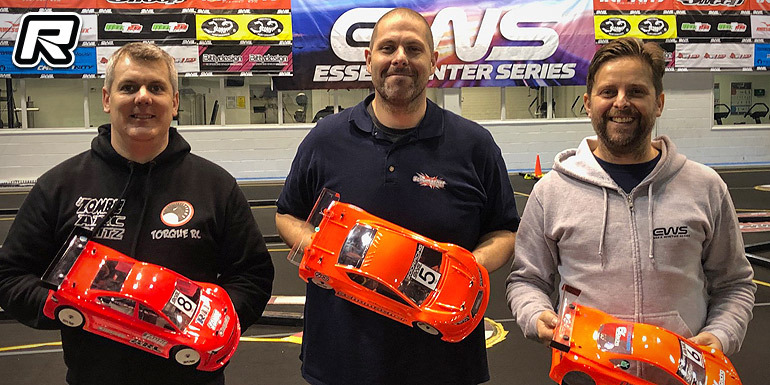 The Amateur Stock class, for non-sponsored drivers and using hand-out Muchmore 17.5T motors has seen close competition all season, with a different driver taking not only TQ but the wins at each round so far. Billy Kavanagh, winner of the EWS International in the class, opened proceedings by topping the first two rounds, with Dave Lumbis second in both. Jamie Murray then fought back by taking Q3 and Q4, and crucially set a faster time to secure pole position. Jonathan Gibbs took second in the third round to line up fourth on the A Final grid. In the final, Jamie led them off and drove a perfect race to take a comfortable win and shake the championship up once more. Billy maintained his second place, with Adam Malins moving from seventh on the grid into third, and challenging Billy for the runner-up spot. The two came together on the final lap, but the race referees ruled it as side-by-side racing and this allowed Billy to hang on to second place, with Adam rounding out the podium. Within the Super Stock class, there are also awards for the top Sportsman drivers, those who hadn’t made a C-Final result last year. The top drivers all made the C-Main this time, and had a straight fight for the honours, with Adam Spencer coming out on top, ahead of Wayne Gorey and Tristan Wilby. Also the fight was on for the Masters division, for the top +40 drivers in Super Stock. 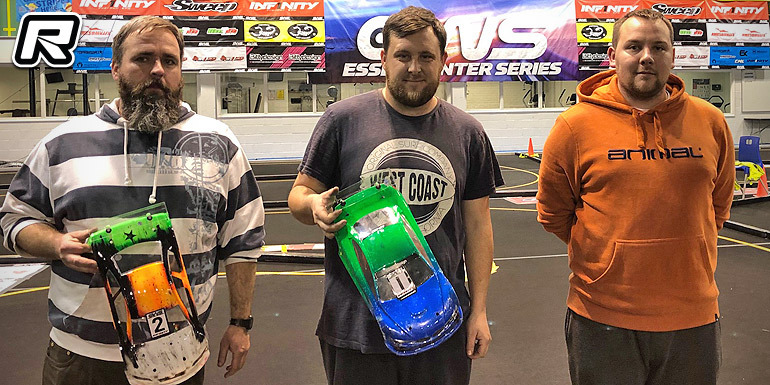 Marcus Askell took the prize this time, with his fourth place in the A Final, with Darren Lee second (eighth in the A Final) and Richard King (third in the B Final). The series continues with round 4 of the championship in February.